The IS F began with just two people – and a lot of desire. They knew instinctively that Lexus was more than ready for a true high performance car, even though there wasn’t anything like it in Lexus’ long term plans. 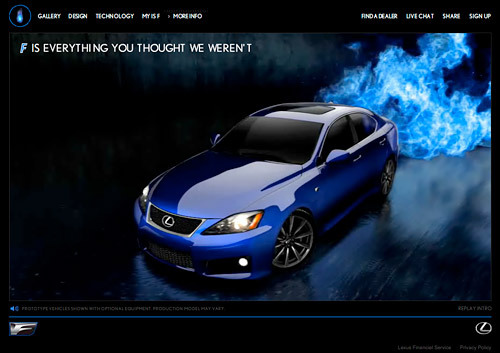 They knew that it must be nothing less than a mold-breaking performance car with expected Lexus virtues. The small team started by creating a concept idea after studying the various aspects of driving enjoyment and soon constructed a “proof of concept” car to present their ideas in the metal. This car was built by equipping a first generation IS body with a 5.2L V8 engine developed by TRD and suspension that incorporated the latest thinking. This ‘proof of concept’ required a car that could really be driven in order to prove its worth – and it was. The team presented it many times and slowly found support in high places. As supporters of the new car increased, the team was able to take real steps toward development. “The first request that I made to the development team was to create a car that can be driven with enjoyment on a racing circuit for more than 10 laps,” said IS F Chief Engineer Yukihiko Yaguchi. The six exterior colors will be: Starfire Pearl, Mercury Metallic, Smokey Granite Mica, Obsidian, Matador Red Mica & Ultrasonic Blue Mica (unique to IS F) . Available options include: A Mark Levinson Premium Surround-Sound System, Lexus DVD Navigation System, Intuitive Park Assist, Pre-Collision System with Dynamic Radar Cruise Control, Headlamp Cleaners and Moonroof Removal. There’s a lot of info to digest, including a great press release brochure from the Frankfurt Auto Show. You can expect to spend an hour on the site, easy.